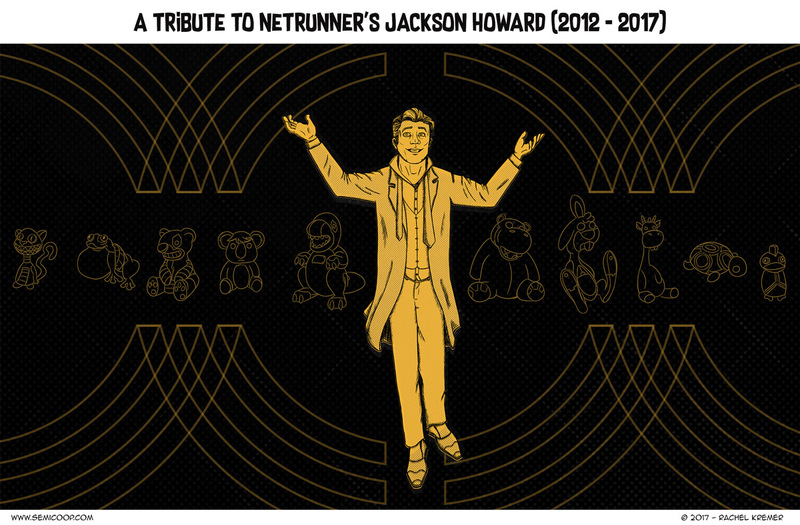 In honor of Jackson Howard, we designed a playmat! 😀 If you like it AND would actually like to have this as a playmat, you can download the full resolution file over here and let it be printed by a service like InkedGaming. Please do let us know if you actually printed it as a playmat – we would love to see it! For the Netrunner players: what cards will you miss the most? – If scorch is probable, can we get enough cards to prevent double scorch? – No, can we beat the traces with enough funds? It is one of those things that defined the whole approach you would go into a match and dictate what you thought you could get away with. Long-term reader of the comic, first comment! I always love when you post about Netrunner, please don’t stop! My partner and I bought into all of Netrunner over the course of the last two years (we’re now just missing a couple of packs). While we are both casual players and play the decks we think look fun (including lots of weird janky ones) and not the ones that are considered best, there are still so many cards that are rotating that I want to try and just haven’t yet had time — for example the Caissa breakers, which are supposed to be fiddly and not that strong, but just look really fun. The cards I’m going to miss the most are actually from the core set; ones that will no longer be in the revised core: Medium and Account Siphon. I can see why they needed to go, and ultimately I think it is the right decision, but it will certainly change drastically how I build my runner decks. I will be in the Netherlands in November and December (though a ways off, in Utrecht). I would love to visit your local game store, since it sounds amazing. I’ll see if I can manage. Our local Netrunner event organizer already proposed that he will build us deck so we can keep competing, so who knows! If you do make it out to the Comicasa, let them know you love Semi co-op, they’ll have a Netrunner related goodie for you :). Thanks for the reply, Heinze! I will try to ensure that I can come by Comicasa sometime, hopefully when there’s a Netrunner event on. If you want to spot Netrunners at the Comicasa: players meet informally on most Thursday nights from 19-21 hours. Tournaments are every first Sunday of the month from 12-17, if you want to join a tournament make sure you contact them to check what type of tournament is being played (onesies, cache refresh, etc.). Personal Workshop, Janus 1.0, Kati Jones, Curtain Wall, Oversight AI, Queen’s Gambit, Scheherazade, Hostage, and John Masanori. O man, Queen’s gambit! It’s a super fun card when played, like Accelerated Beta test that is also going away. I feel that they are moving away from cards with a unpredictable outcome but they are so cool during a game. On the other hand, I’m so happy with what was *saved* from rotation! With the announcement of the Revised Core Set (or Core 2.0 for short), many of the cards from the first two cycles were made legal, in exchange for some core set cards becoming effectively “banned”. This meant that my favorite Runner ID, Chaos Theory, was made evergreen! Of course, due to where the meta has gone, I’ll probably play Smoke or Bios instead, but Chaos Theory is my *favorite* ID. They even made her a little older, and a little more mature, in the Revised Core Set artwork! If you were worried about the first two cycles of data packs becoming worthless, don’t! A significant number of those cards are still tournament legal, and important to the new meta!